The “negotiating arena” is the place where revenue, profits, and jobs are at their greatest risk. The outcome of a negotiation impacts the entire organization, with the impact extending to the financial and operational health of the organization and the job security of colleagues. In life sciences, the stakes are higher. A negotiation between a life science company and a provider or payor will impact the treatment options for a condition or disease, thereby potentially impacting thousands of people with a chronic disease or a select few impacted by a rare condition with limited treatment options. Now, more than ever, it is necessary to conduct meaningful conversations between life science companies and the stakeholders impacted by their products. 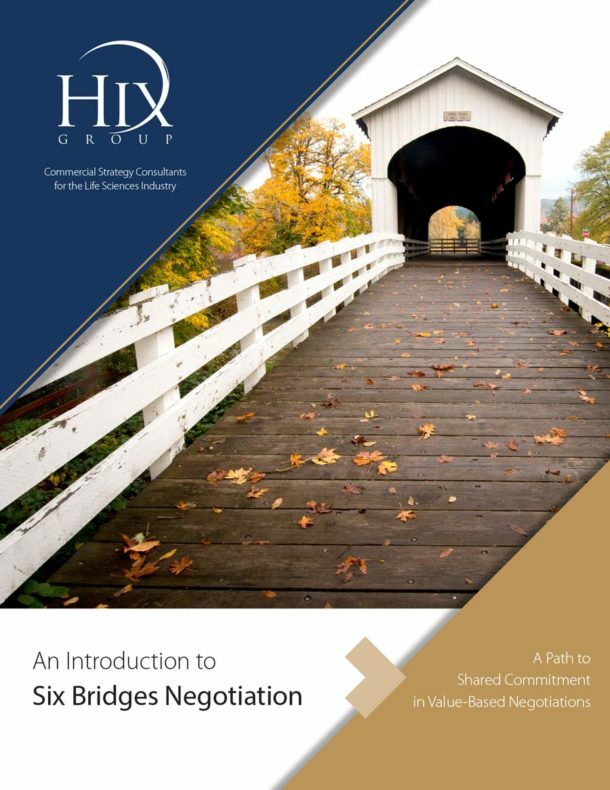 Six Bridges is the Hix Group’s proven approach to successfully negotiating enterprise-to-enterprise agreements with payors, providers, and participants in the value-chain. The intended audience is pharmaceutical, medical device, and life science professionals responsible for positioning their organization and their product portfolio with healthcare decision makers, influencers, suppliers, and distributors. A two-day training session with account executives and leaders of life science and healthcare organizations seeking to prepare leaders and account teams for negotiations. All training sessions are customized to the opportunities and challenges facing the client organization to ensure the training translates to the negotiating arena. A case-specific workshop with executive teams in the midst of a negotiation with that will impact the future direction of the company. In this scenario, Hix Group leads the organization through the Six Bridges path to develop the negotiating strategy for the client with the customer, supply partner, or distributor. A quarterly or bi-annual strategic session with organization and/or brand leaders seeking to ensure alignment between the strategic priorities of the organization and the priorities of payors, providers, patients, and supply chain partners. You’re subscribed! Please download your free copy of the Six Bridges Negotiation Paper here. Subscribe to receive updates from Hix Group team today. You'll receive our free Introduction to Six Bridges Negotiation Training white paper as our way of saying thanks. By subscribing you agree to receive emails from Hix Group and accept our terms and conditions. Any information you share will be kept confidential. Ask Hix Group to conduct a Six Bridges training session to prepare your account executives for the rigors of value-based negotiations with payors and providers. Ask Hix Group to team with your executives to develop a Six Bridges response plan to a commercial threat originating with a payor, provider, supply chain partner, or competitors. Ask Hix Group to conduct a Six Bridges working session with executive teams before or following a merger or acquisition. This working session will ensure strategies and tactics with customers and customer segments reflects the combined competencies of the merged organization. The following selection of representative engagements provides insight into the capabilities of Hix Group and the work product sought by our clients. A medical device company required an immediate response to a large supply chain partner expressing a desire to white-label the company’s product as part of its broader offering to hospitals and physician practices. Hix Group served as a consultant for a 90-day period to formulate the response, equip the leadership team to negotiate revised terms with the supply chain partner, and prepare the go forward messaging to better position the company relative to international sourcing threats. "Hix Group's knowledge of customer relationship management was superior to all others I interviewed. After hiring them, our CRM project ran smoothly and robustly, with outstanding analytics and depth of options." "We found Hix Group to be masters in the art of story-telling. Hix Group is uniquely qualified to assess and develop the positioning strategy for a product, the target audience profiles, and the messaging required to separate from the noise in the market." "Hix Group has a keen ability to quickly navigate through complex business situations and get to the two or three critical business issues that need to be addressed to grow the business." "While their strategic mind set, creativity and out-of-the-box thinking are very impressive, it is their ability to put their ideas into action that is most impressive to me." "Their diverse background gained from their time in the pharmaceutical, healthcare delivery, and medical device industries allows Hix Group to see the big picture and position companies and products both creatively and strategically. Hix Group's ability to see solutions rather than problems sets them apart from others as a natural organizer and a leader in the healthcare industry." "The magic inside Hix Group is the ability find the most simple and productive path to the opportunities in front of our business. Hix Group delivers simple paths to performance that can be executed across the functions of the business, marketing, sales and operations." "Rather than providing a mobile plan for the business, Hix Group took the opposite approach. Hix Group first invested in understanding our consumer journey and the operational elements required to support the journey to best integrate and align the mobile journey with our the priorities for each phase of the consumer’s engagement with our brand." Interested in getting started? Send us a note today. We look forward to speaking with you soon. © 2017, 2018 Hix Group. All Rights Reserved.